It was an exciting year for time capsules! Am I allowed to say without getting my lunch money stolen and then violently stuffed into a locker? The oldest known message in a bottle was discovered in Canada. We finally found the long-lost Steve Jobs capsule in Colorado. And a time capsule even left the solar system! So without further ado, we present the ten coolest time capsules of 2013. Merry capsuling and a happy new year, friends! Earlier this year a funeral home on the Canadian side of Niagara Falls found a time capsule with a rather peculiar artifact inside: a 65-year-old piece of cake. The cake was probably from the time capsule sealing ceremony (capsulers know how to party). And I like to imagine some half-drunk person at the ceremony earnestly including the piece of cake just in case the people who opened it got hungry. Thank you kindly, imaginary drunk person from 1948. Back in August, a church in Arkansas opened a time capsule from 1927 that was filled with all the things you might expect in your typical capsule: coins, old newspapers, and other boring ephemera. But no one was quite sure what this weird-looking dinglehopper might be for. Was it a s’more maker? Was it a lightning rod? Was it a frog gig? Also, what’s a frog gig? Frankly, your guess is as good as mine. And as far as I can tell, the church still doesn’t know for sure. Over the last century, people have built time capsules out of everything from baby coffins (sad) to cars (fun!). But very few people have thought to turn a 43-foot tall missile into a time capsule. That’s precisely what the good people of Kansas did back in 1973, though. This one even had microfilm hidden inside. How Cold War of them. A church in Oklahoma City cracked open its “Century Chest” time capsule this year to find a collection of pristine artifacts from 1913. Clothes, letters, newspapers, a telephone, and even an Edison Graphophone were among the dozens of items discovered. Given all the incredibly valuable items found in the Century Chest (not to mention their immaculate condition) I wouldn’t be surprised if monetarily speaking, this was the most valuable time capsule unearthed in 2013. When the city of Scranton, Pennsylvania opened a time capsule this past summer the smell of century-old tobacco wafted out like a kick in the nose. Apparently somebody threw a cigar in the old thing back in 1900, thinking it’d be a treasured relic whenever it was finally opened. The local newspaper even boasted that the cigar looked, “about as fresh as the day it was rolled.” No word on if anybody tried to smoke it. I’m no doctor, but I’d wager that a century-old cigar deserves roughly two fistfuls of surgeon general warnings. A time capsule assembled by children in 1968 wasn’t supposed to be opened until 2068. But when the demolition of a Pennsylvania elementary school was planned for later this year, the school said, what the hell. Open that sucker up! The capsule included drawings and stories from kids who were quite clearly inspired by futurist pop culture of the time. Warning: the drawings depicting a Jetsons-esque future are equal parts adorable and depressing. Yes, this past summer a time capsule assembled in 1977 actually left the solar system. Voyager I departed Earth during the Carter administration and contains a friendly message to any aliens that might happen upon it. A time capsule is the furthest manmade object from Earth right now. And nothing could make capsule nerds more proud. When a church in Michigan recently opened up a 1912 time capsule they were fully expecting to find old newspapers, photos, and church documents. They weren’t expecting a mysterious package wrapped in brown paper and addressed to the descendants of an unknown man. But that’s exactly what they found. The capsule contained a photo of the man in question (a Reverend J. E. Foote) and the church set off a search for any descendants. As of this writing, there have been two possible descendants found—one in Texas and another in North Carolina—though the church hasn’t made a final decision about whether to open the package or wait until one of them can travel to Michigan. 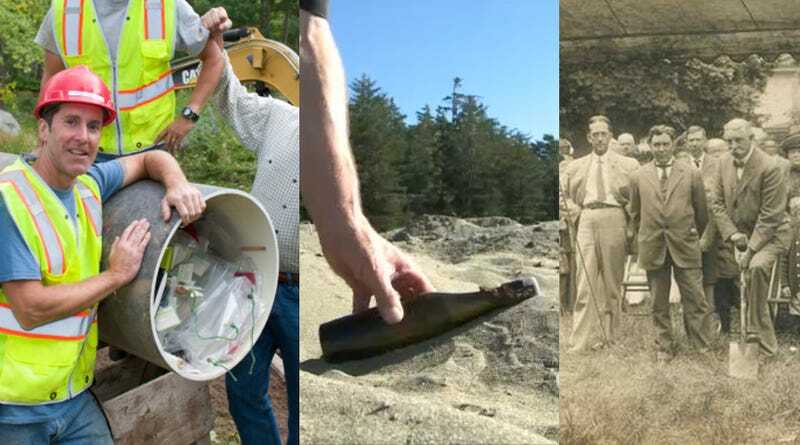 It looks like this time capsule mystery won’t be fully solved until 2014. This past summer a Canadian man found the oldest known message in a bottle. The only catch? He refuses to open it. The bottle is likely from September 29, 1906 and was signed by a man named Earl Willard who was sailing from San Francisco to Bellingham, Washington. But the only reason we know any of this is because you can read that much just looking through the glass of the bottle. What other treasures might this bottle hold? We won’t know until its finder decides to finally open the damn thing. With all the lost, stolen, and forgotten time capsules we explore on this site, it’s exciting when we get to check a highly coveted one off the list. In 2013 we got to do just that with the “Steve Jobs” time capsule in Aspen, Colorado. The “Steve Jobs” capsule had been missing since people first started looking for it in 2000, and it included contributions from dozens of people who attended a conference in 1983. But Steve Jobs’s contributions to the capsule—including an original Lisa mouse—made this one of the most sought-after treasures in the time capsule community. The crew from the National Geographic Channel show “Diggers” finally dug up the 13-foot tube in September, closing the book on a long sought after piece of time capsule history. But don’t worry. There are plenty more time capsule mysteries to be solved. Happy capsuling!